Signature Capture device from Ingenico facilitates electronic signature capture to ensure a fast and secure customer checkout. Combined with an electronic pen and a capacitive screen technology, this device ensures to produce the most rugged and responsive implementation for signature captures and touch input. 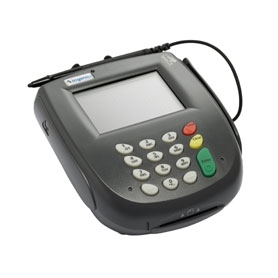 With a Triple Track Magnetic Stripe Reader and Smart Card Reader, the i6550 Signature Capture Terminal provides peace of mind for both the consumer and the retailer.